Managing a store, small business or factory is not an easy task. There are so many employees to deal with, shifts to organize and other tasks to manage. 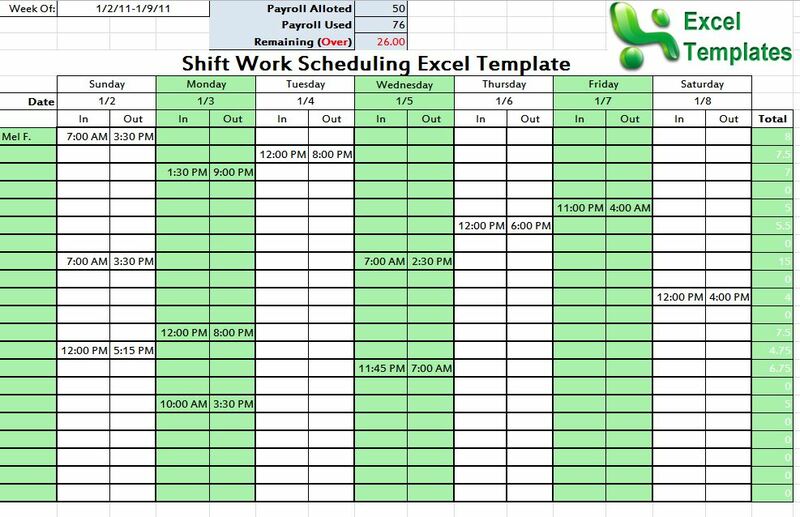 If you want to make your job easier, download the shift schedule template from Microsoft Excel. This template is designed to make a manager’s life easier. Instead of having to create your own shift schedule template, simply download the one available online. The template allows you to write down the names of every employee who works at the store/business, create initials for these employees, and place their names in certain sections, depending on when they work. The Microsoft Excel shift schedule template is very easy to use. Download the template and open the file in Excel. You will see a blank shift schedule template, which can be edited based on your individual preferences. The right section of the template is where you will type up everyone’s names. Add initials for each employee, as these will be used on the rest of the template. Enter in the maximum allowable weekly hours, as well as the hours they work each week. This will give you quick access to every employee’s hours, and you will know whether any of them are eligible for overtime pay. There are two shift periods you can edit, along with three sub sections for each period. Shift period one can pertain to weekdays, while period two refers to weekends. The three sub sections will refer to shift timings. For example, period one is 9:30 am to 12:00 pm, period two is 12:00pm to 3:30pm, and period three is 3:30pm to 7:00pm. When shift periods have been established, begin adding employee initials to the section they will be covering. For example, if Wendy Holt is covering sub section one of shift period one on a Monday, enter the initials WH into that time slot. Ensure that you have each employee’s full name and initials spelled correctly. You do not want misunderstandings pertaining to the schedule, as it might leave you with too few or too many employees at a certain time slot. Enter in hours worked on a daily basis, so you can keep an accurate track of how many hours each employee has completed. If you wait until the end of the week, you might forget the correct data from Monday or Tuesday.